If you’re looking for the BEST Vanilla Cake recipe for delightfully soft, buttery classic vanilla cakes then you’ve come to the right place! 🙂 I’ve shared all my tips (for every step) for getting the best results when making a homemade vanilla cake. 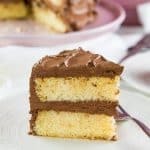 This is a comprehensive guide to making delicious vanilla cake as an 8 inch cake, 9 inch cake, sheet cake, or even cupcakes, with chocolate OR vanilla frosting! Every cake baking adventure starts with a good vanilla cake! It’s the universally loved cake flavor that acts as a great canvas on which to build other flavors. So today, I’m going to be talking about how to make the BEST Vanilla Cake recipe ever! It’s the first cake that I learnt to bake, and it’s still my go-to, especially since K loves it too. Here, I’ll be sharing STEP BY STEP instructions on how to make this amazing homemade vanilla cake that’s sure to be a family favorite for you! 🙂 Plus, I’ll be sharing a couple of simple variations on this classic vanilla cake recipe as well. These variations include a simple citrus scented vanilla cake, and a classic Sri Lankan ribbon cake! So why is this the Best Vanilla Cake recipe? The cake is light, with a great crumb and is moist too! It’s perfect for layer cakes, sheet cakes or even as cupcakes! So let’s talk about how we achieve Vanilla Cake Perfection, step by step. 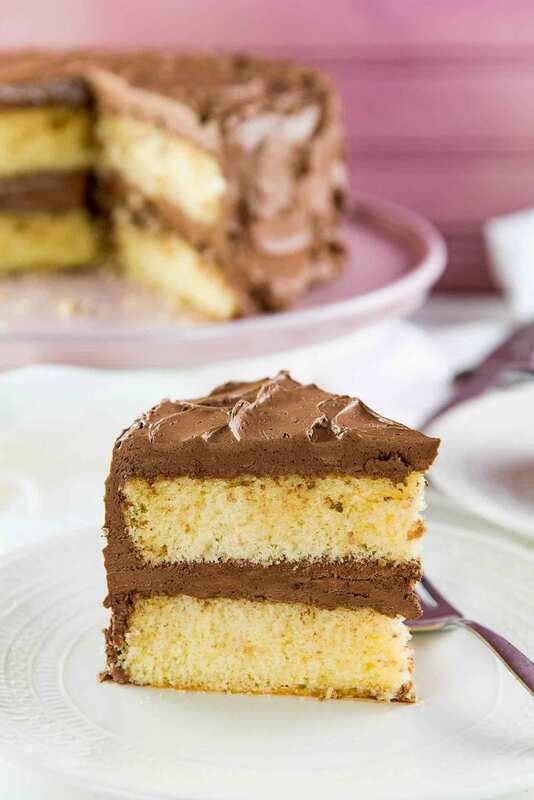 When oil is used in a cake, the resulting cake has a softer texture and a lighter crumb. Because there are no milk solids in oil (unlike in butter), it allows the cake crumb to be finer and lighter. When you use butter on the other hand, the resulting crumb is more dense, and there’s more moisture in the cake too. This is due to the milk in the butter which contributes to the dense crumb. However, it adds more flavor than oil as well. So while I do love an all butter cake, I prefer using BOTH butter and oil for my homemade classic vanilla cake, because this way I get the best of both worlds – plenty of flavor AND a delightfully light texture. There are TWO ways to START making this homemade vanilla cake. 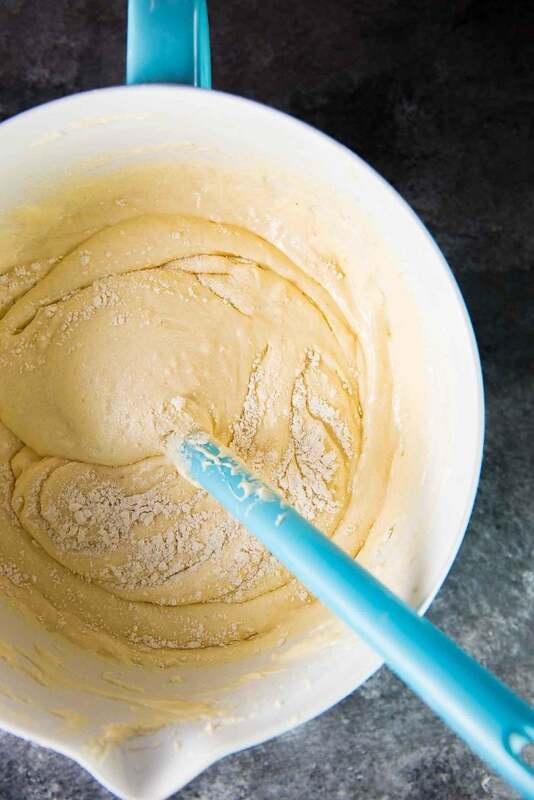 That’s either by mixing the melted butter + oil with the sugar (you wouldn’t need a hand-mixer for this, you can use a whisk instead), OR by creaming the room temperature butter + oil with the sugar by using a hand-mixer or stand mixer. These two methods will result in vanilla cakes that are SLIGHTLY different in texture as explained below. 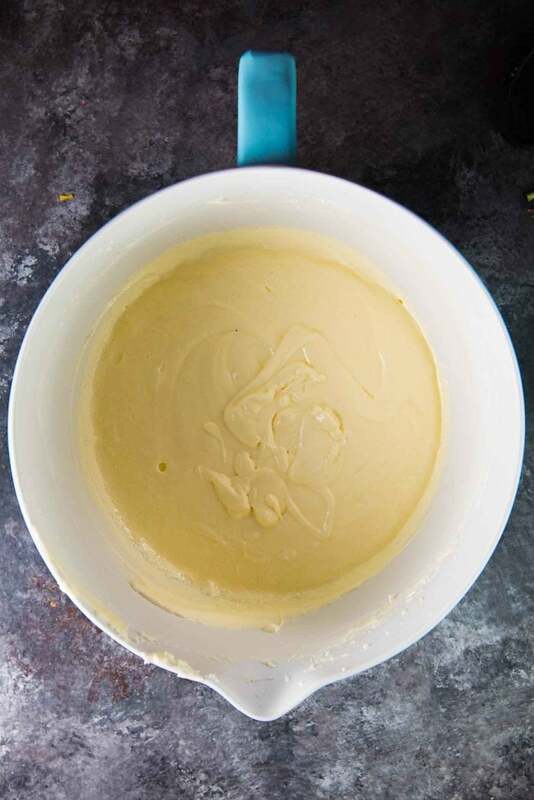 Melted butter + oil + sugar + mixed with a whisk – since air is not being incorporated into the batter here, the cake will not have the same height as in the other method, and the cake crumb will be slightly fudgy (or more dense). 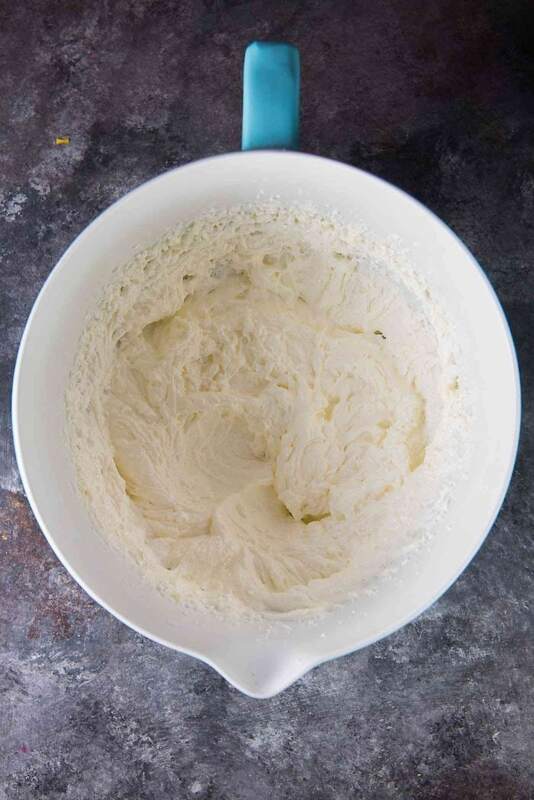 Softened butter + oil + sugar + creamed with a hand mixer – as air is being incorporated into the batter, the resulting cake will have more height, and be a little lighter. You can add all of the eggs together OR add them separately. I prefer adding them one at a time (it’s what my mother taught me too), mixing in each egg before adding the next. This also comes down to incorporating air into the batter so that you have a lighter and fluffier cake. STEP THREE – Adding the milk/buttermilk + VANILLA! There are two ways in which you can add the milk to the batter as well. You can either alternate between adding the milk and the flour, OR you can add all of the milk first, mix it in, and then add the flour. You can also choose between buttermilk, or full cream milk (or half and half) mixed with vinegar or lemon juice. This choice won’t affect the quality of your vanilla cake however. One of the most important steps in a vanilla cake is obviously the vanilla! So make sure to add a GOOD vanilla extract because this can make or break the flavor of your homemade vanilla cake. A lower quality vanilla (imitation vanilla) will really amplify the compromised flavor of your cake. So look for a VANILLA EXTRACT, rather than imitation vanilla. Better yet, look for Madagascar bourbon vanilla, which is the most flavorful of vanilla extracts. 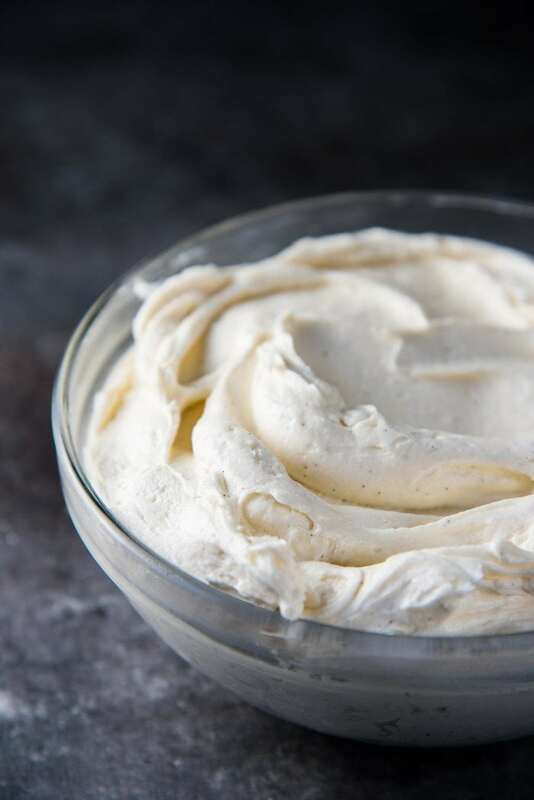 You can use vanilla bean paste (or fresh vanilla) as well if you choose. Sift the flour + baking powder together. This is important because it evenly mixes the ingredients together and removes lumps. If you’re like me, and don’t feel like sifting the flour sometimes (especially if the flour is pre-sifted), then place the dry ingredients together and whisk it all together. This allows the flour and baking powder to be evenly distributed when you fold them into the cake batter. 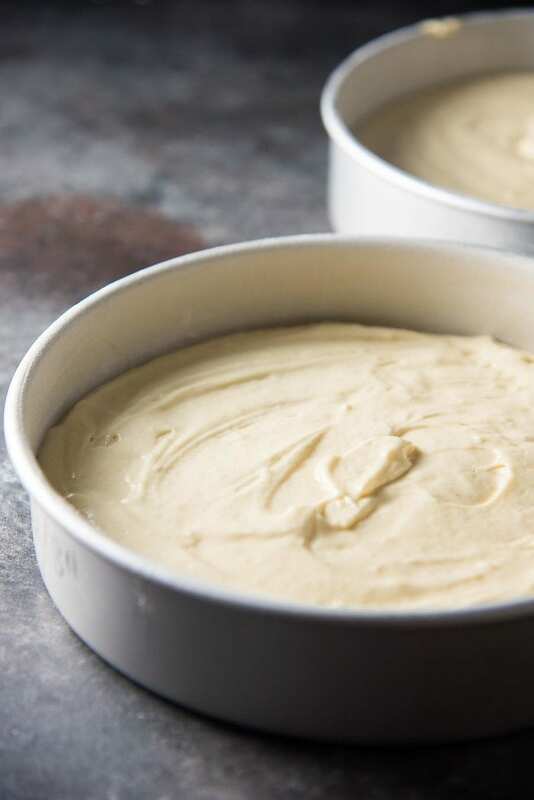 I like to add the flour into the vanilla cake batter in 2-3 additions, so that I can make sure each addition is well incorporated into the batter and most importantly, there are no lumps. While I like to use a whisk or spatula to fold in the flour, you can use a hand-mixer or stand-mixer (for double batches) on the LOWEST SPEED. However, keep in mind that the more you mix the flour, the more you “work” the flour, and the more you develop the gluten which will result in a tougher cake. So it’s important that you only mix the flour until it’s incorporated (a few white streaks in ok!). Another option would be use CAKE FLOUR instead of all-purpose flower which has less gluten than AP flour. I baked this cake in 8 inch pans for a 2-layered cake. But you might ask – can I bake this cake in a 9 inch pan or as a sheet cake? Why yes, you totally can! 2 x 8 inch pans = bake for 25 – 30 minutes (mine takes about 27 minutes). 2 x 9 inch pans = bake for 20 – 25 minutes (mine takes about 22 minutes). 9 x 13 cake pan (for a sheet cake) = bake for 30 – 35 minutes (mine takes about 32 minutes). Cupcake pans = bake for about 15 – 20 minutes (mine take about 17 minutes). 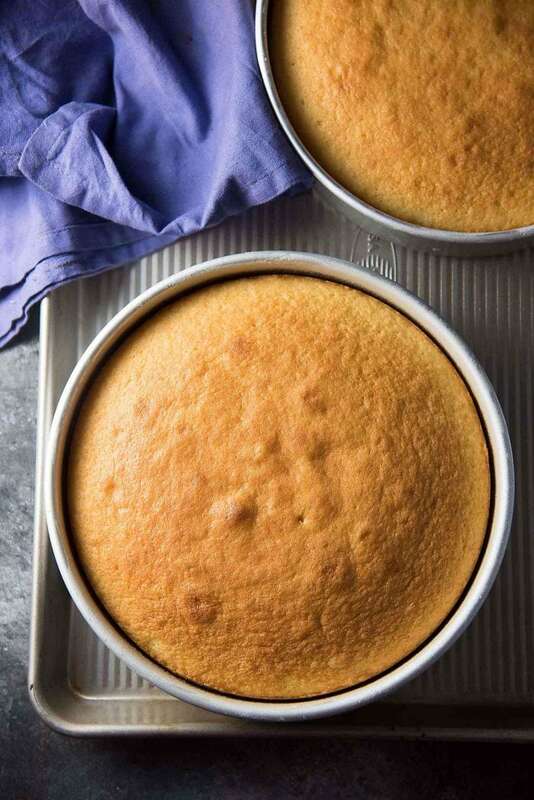 How to prepare cake pans for baking? Preparing the cake pan for this easy vanilla cake is simple, but it’s probably my least favorite part as well. My sister used to be my designated pan preparer, but now I got to do it myself. I find that parchment paper makes my job easy. I ALWAYS line the bottom of the pan with parchment paper. For round pans, I butter and flour the sides, but I usually use parchment paper to line the sides of square or rectangle pans. I just go with whichever feels convenient at that moment in time. 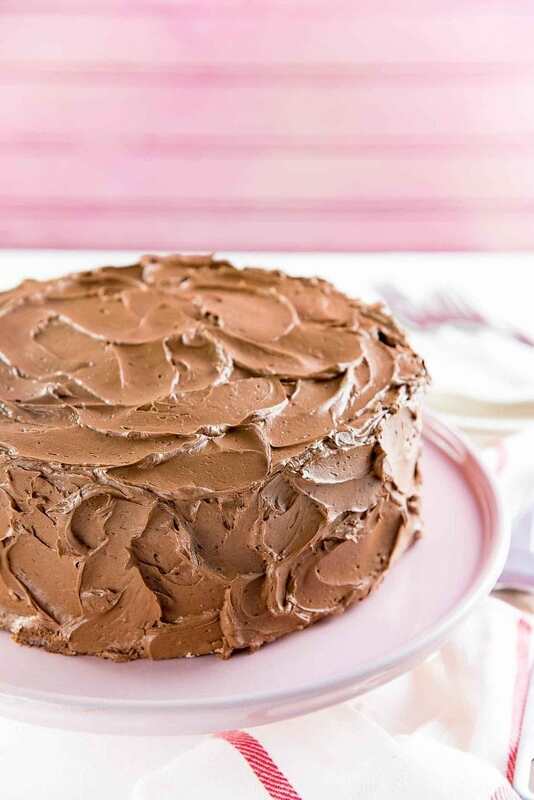 🙂 I personally don’t like using non-stick sprays for my cake pans, but you CAN use baking goop if you like (homemade non-stick paste), and this recipe from I am Baker would be a recipe that I trust. Could or should I use even baking strips? YES! You can use baking strips for a more even, flat surface on your cake. I do use them when I want to make a naked cake (baking strips keep the sides from turning brown and helps keep the cake surface flat). But I don’t use them for home baking, just out of convenience. How do I know if my cake is done? I prefer baking my cakes at 325°F because it bakes the cake more evenly, even though it takes just a tad longer. The best way to tell if your cake is done is by pricking the center of the cake with a toothpick or cake tester. If it comes out clean, then the cake is ready! How can I test the cake done-ness WITHOUT pricking the cake? If the center of the cake is baked, it won’t wiggle when the pan is gently shook. And if you press the center of the cake surface, and if the surface springs back up, then also the cake is done. But if that indentation remains, then the cake could use a few more minutes of baking. Just make sure to check the cake regularly towards the end to avoid over-baking the cake. Because over-baked cake = dry cake! The good news is that there aren’t really any rules when it comes to decorating your homemade vanilla cake! 🙂 Well, other than just waiting till the cake has cooled down completely. Once it has, you’re good to go! Because if the cake is warm, the frosting will melt, and that’s obviously no good. You can decorate your vanilla cake with my classic vanilla buttercream frosting or my classic chocolate buttercream frosting (I used a chocolate frosting for the cake in this post). 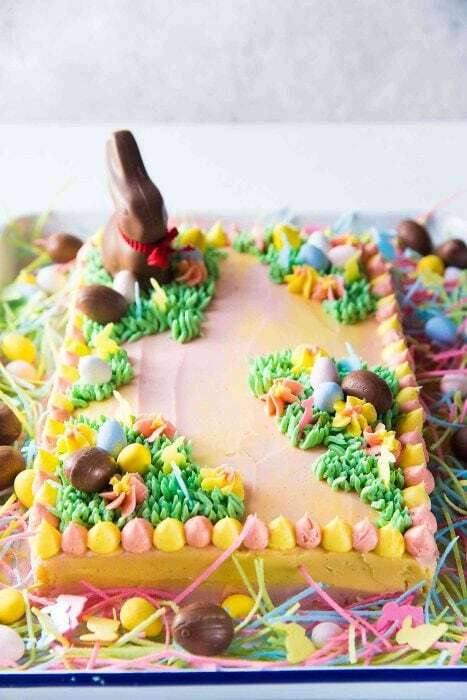 You can create a water color effect on your cake too, by following the method that I used in this fun Easter cake here. Or use Swiss meringue buttercream like in this Raspberry cake with rose Swiss meringue buttercream. The result is seriously THE BEST VANILLA CAKE EVER! A deliciously buttery, light and soft vanilla cake that is to die for! Plus it’s so simple to make too! 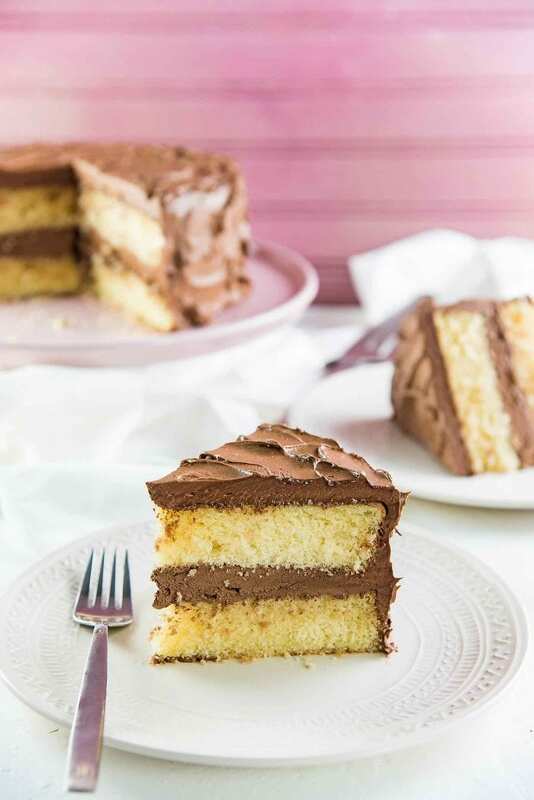 My favorite way to eat vanilla cake is with chocolate frosting, as in this vanilla cake in this post. 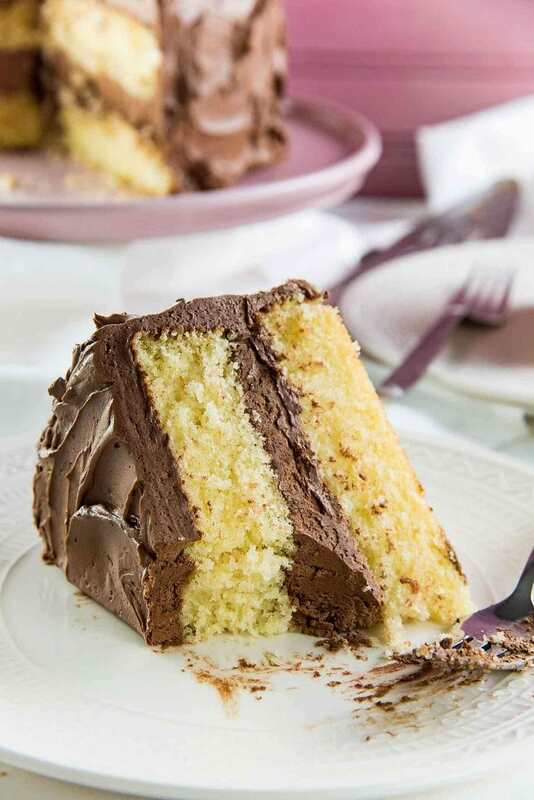 I love the contrast of the sweet vanilla-flavored cake with the bittersweet chocolate frosting. 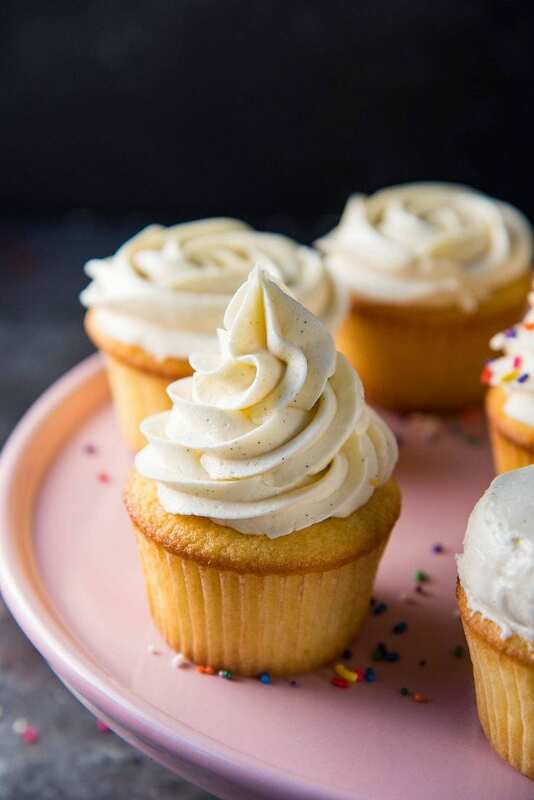 But it does taste absolutely delicious with a classic vanilla frosting too (like these cupcakes in this post). 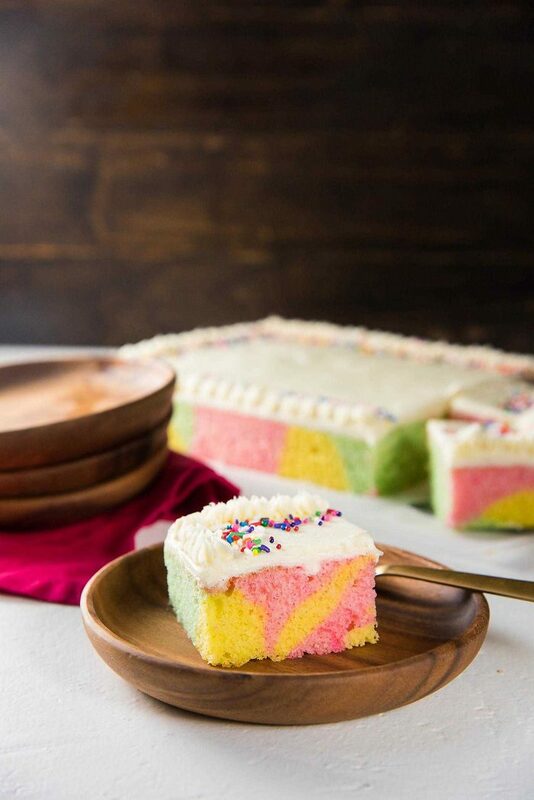 When I was living in Sri Lanka, we used to make vanilla cakes that were colored and swirled into what we called “ribbon cakes”! This was a very popular and whimsical option for birthdays and celebrations. AND YOU CAN NOW MAKE THIS AT HOME WITH THIS RECIPE! 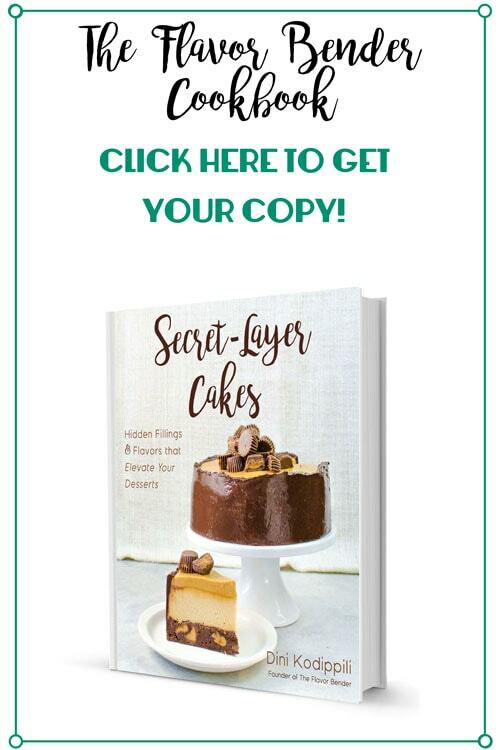 If you love cake, then you will absolutely love my new cookbook Secret Layer Cakes! If you don’t have a copy, then you really really should get one NOW! 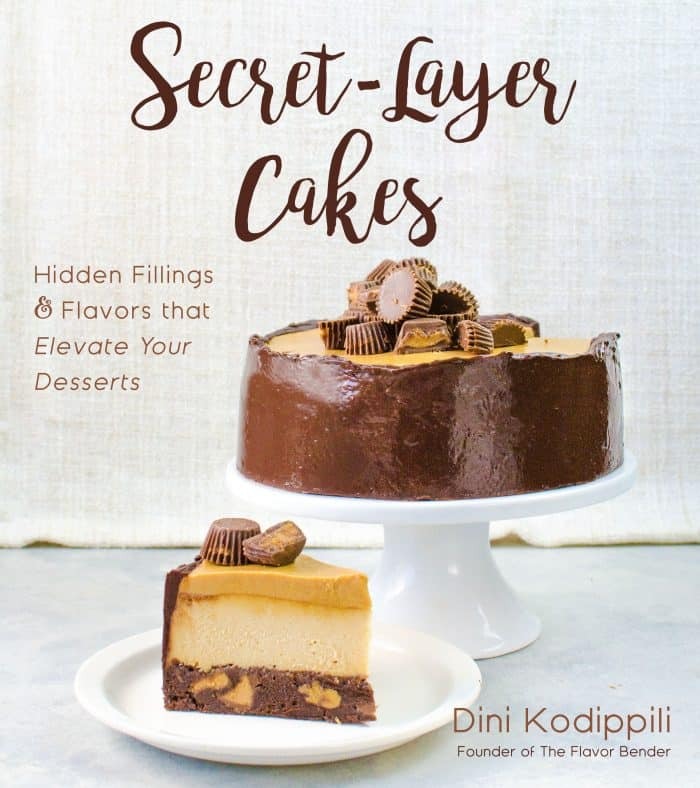 🙂 That is, if you like combining a fantastic array of delicious flavors and textures and different types of dessert into outrageously inventive cakes (that’s where the idea of secret layers comes from! ), that are also surprisingly easy. There are 60 recipes in the book for cheesecakes, no bake cakes, ice cream cakes and all types of dessert mash ups, like this Fudgy S’mores Brownie Pie here. Best Vanilla Cake - delightfully soft, buttery, classic vanilla cake with a creamy chocolate or vanilla frosting! With heaps of tips to get perfect cakes every single time. Preheat the oven to 325°F. Line the bottom of two 8 inch pans with parchment paper, and butter and flour the sides. Set aside. 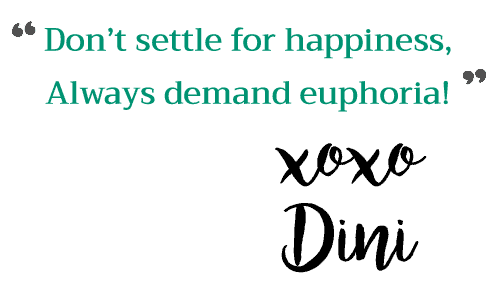 (See recipe notes for baking instructions for 9 inch pans, cupcake pans or 9 x 13 inch pan). Whisk the butter, oil, salt and sugar until the mix is creamy and fluffy. Add the eggs, one at a time, mixing well between each addition. Mix in the milk (and vinegar) mix and vanilla. In a separate bowl, sieve the flour and baking powder together and whisk to combine. Fold the flour into the wet ingredients in 2 - 3 additions, and mix until just combined. Pour the batter into the two prepared pans. Bake in preheated oven for about 25 - 30 minutes, rotating the pan halfway through baking time. (See notes for baking instructions for 9 inch pans, cupcake pans or 9 x 13 inch pan). The cake should be springy to the touch (when you gently touch the middle of the cake, it should spring back up). Remove the cake from the oven and let it cool slightly in the pan. While still warm, turn the cake out onto a wire rack and let it cool down completely. Place one cake layer on a cake serving plate or decorating plate. Place about 1/2 - 3/4 cup of the frosting on top of this cake layer and spread it evenly. You can choose to add a little more of the frosting if you like. Place the second cake layer on top and press it down gently to make sure the cake layers stick together. Apply a thin coating of the frosting to completely cover the cake. This is the crumb coating. Allow the crumb coating to set in the fridge for a few minutes. Spread the rest of the frosting over the cake evenly. Use an offset spatula to create swirls for an old fashioned cake look OR use a bench scraper or spatula to smooth out the frosting. Baking time for 9 inch cake pan - 20 to 25 minutes baking time. Remember to rotate half way through. Baking time for cupcake pan - fill the cupcake liner with the batter about 2/3 of the way. Bake for 15 to 20 minutes. Remember to rotate half way through. Makes 12 cupcakes. Baking time for 9 x 13 inch pan - 28 to 33 minutes. Remember to rotate half way through. 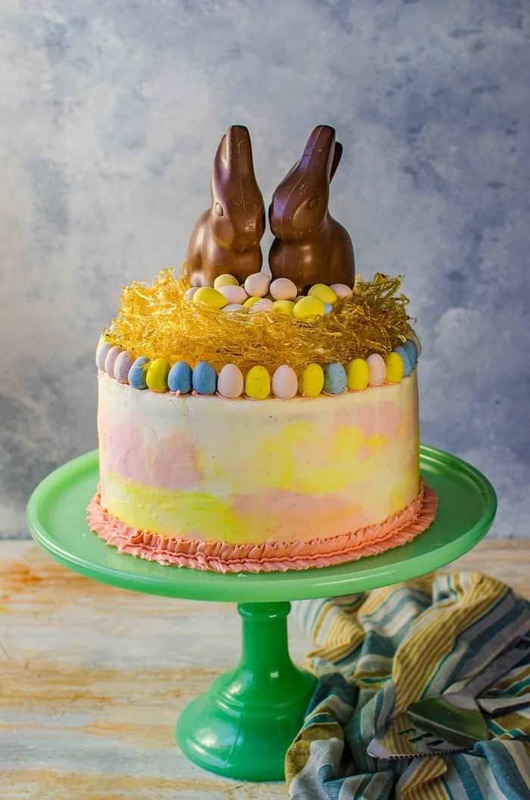 If you liked this cake, and like Easter chocolates, then you will LOVE this Swirled Pastel Easter cake! 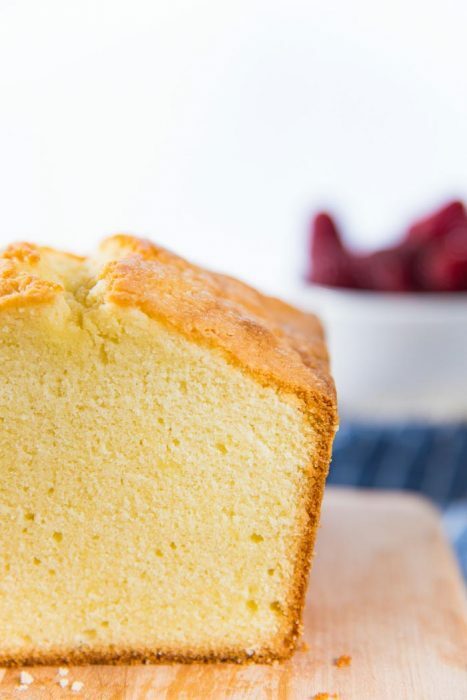 Now you can make perfect Buttery Pound Cake with thie trouble shooting guide! Is Chocolate Cake more your jam? 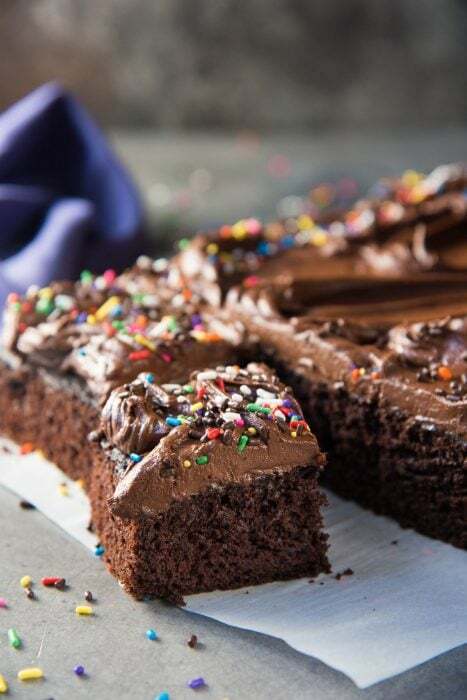 Or how about this Fudgiest One Bowl Chocolate Sheet Cake recipe? If you liked this classic vanilla cake recipe (soft and buttery vanilla cake), don’t forget to subscribe for new (and free) recipes by entering your email address on the side bar (and get all these recipes delivered straight to your inbox), so you don’t miss out on a thing. You can find me on FACEBOOK, TWITTER,INSTAGRAM, PINTEREST, YOU TUBE and GOOGLE-PLUS too. Made this recipe once and loved the flavor and texture the day it was made. Only recommend eating it the day you make it. Unless your a baker and know how to store cake. I do not! It did not store well and dried out overnight, which was very dissapointing. I wrapped it in plastic wrap, and had one half in fridge amd froze the other to test these methods. Both ruined the cake and dried it out completely. I followed the recipes exactly amd felt the cake was amazing the day it bakes. Any tips for storing the cake for a day or two so I can make it again for my daughter’s birthday party? Or is this just not that kind of cake? I love recipes and tips foe storing, so that you can asemble later. Thank you!! I’m sorry the cake dried out for you after storing, that’s really surprising. I’ve made this cake numerous times, and that’s never happened to me before, and it stores really well. However, I do double wrap my cakes that haven’t been frosted with plastic wrap (making sure it’s tightly wrapped), and place it in an airtight container as well. Any prolonged contact with air will make the cake dry out. I also don’t store the cake in the fridge because that dries out cakes faster (unless the cakes are frosted, or I’ve added syrup to the cakes). I store cakes that way in a cool place at room temperature for up to 2 – 3 days, or in the freezer (making sure it’s tightly wrapped with 2 – 3 layers of plastic wrap, and then either wrap it further with foil, or put it in an airtight container to avoid freezer burn). Even the photos in this post are of a cake that I baked the day before, and then frosted on the day I cut the cake and took pictures. Hope that helps! I just took the cake out of the oven after 27minutes..it is not a honey color it looks white..I tested it & it’s done..I hope it’s not dry…& it didn’t rise that much..I did 8 “round..what could have happened I followed the recipe..
Hi Marie! Sorry for the late reply. This hasn’t happened to me before. Usually if a cake doesn’t rise, it’s because the baking powder or baking soda was stale and didn’t make the cake rise properly. Baking powder also helps a little with the browning of the cake too. I would recommend testing the freshness of the baking powder to make sure it’s still active. Yes, you can use EVOO instead of vegetable oil, but keep in my mind that it will add the flavor of the olive oil to the cake too. If you like the flavor of olive oil, then it will taste good in the cake too. I would like to make this recipe for a Christmas cake i’m making. Could you use buttermilk instead of the milk? Yes you can use buttermilk instead of milk for this cake recipe. Hope that helps! Made this for a birthday. Easy to make, delicious moist cake, easy to work with icing. Made a great impression when the cake was cut and the layers revealed. A hit all around. Can I add powdered cocoa to make it chocolate? If so how much? Hi, so I don’t have baking powder but I do have baking soda can I use that instead or will it ruin everything??? I wouldn’t recommend using only baking soda for this cake, because I haven’t tested substituting the baking powder with baking soda. Baking soda is stronger and reacts differently than baking powder, and the cake texture and taste may change if you use baking soda instead of the baking powder. I would recommend trying a vanilla cake recipe that has been tested to work with only baking soda in the recipe. I hope that helps! To Make 1 Tablespoon of Baking Powder. Measure 1 teaspoon baking soda and 2 teaspoons cream of tartar. My child couldn’t have baking powder because of the other ingredients added to it so I made my own for years. I’ve been having issues with my vanilla recipe for a while now. I’ve tried various methods yet it comes out dense. Thanks Dini for this recipe, God bless you. Hi if I wanted to do a 3 layer naked cake with 8in pans would I 1.5 the recipe do you think? Thanks! Yes, that’s right. This recipe is for 2 x 8 inch cake layers, so for 3 x 8 inch cake layers, you would have to multiply the quantities by 1.5. I hope that helps! I had forgotten to take the butter out so it could warm up to room temp. So I put it in the microwave. Some of it got melted. Could that be it? Yep, absolutely! Since the butter was melted, it’s not able to whip and incorporate air like regular softened butter would be able to. So the lack of air in the butter could definitely make the cake more dense. What I would recommend for next time is to cut up the cold butter into small pieces and keep it somewhere warm so that it can soften up in under 30 minutes. Even grating the butter, will make it soften faster 🙂 I hope that helps. I’m making this cake for my birthday today. (Yes, you read that right.. I’m making a cake for MY birthday.) All I have is salted butter. Will that be ok? If so, do I not need to add the salt? Yes, you can use salted butter for this recipe. You won’t need to add the extra salt in the recipe in that case either. Don’t hesitate to contact me if you have any other questions. Don’t forget to let me know how the cake turned out too! The cake tastes great but it came out kinda dense. Im not sure what happened. Oh no! I haven’t had the cake come out dense anytime I have made it, because it’s meant to be buttery and light. The only explanation for a dense cake that I can think of is if the baking powder is not fresh (older than 6 month) or if butter wasn’t creamed properly too. Also if the cake is made with weight measurements, then the cake should be nice and fluffy. Sometimes volume measurements can add too much flour and make the cake dense too. I’m fixina start trying this again. Can I mix the butter with my whip attachment instead of the paddle? I generally don’t like to use the whisk attachment for cakes, since the paddle attachment does a better job of making the butter and sugar creamy. You can also risk over whisking the mixture, especially when eggs and flour are added. But, if you only have the whisk attachment, you could use it, but will have to make sure you don’t over mix the batter. Hi I want to use this recipe for my sons birthday cake but I only want to use one tin that is 26cm wide and 7cm high (Square Tin). Is this ok? How long would I cook it for? Thank you! Unfortunately, I haven’t baked this cake in a 26cm square tin. What I can recommend is for you to fill the cake pan about 2/3 of the way up, and bake it according to the instructions in the recipe here, and to keep an eye on it until it’s baked through. Sometimes, with larger and deeper cakes a lower baking temperature (300°F) can also be recommended to ensure that it bakes more evenly, but this will increase the baking time too. Sorry I couldn’t be of more help. I baked this cake tonight and it was delicious, buttery and fluffy. I used apple cider vinegar and it was great. Thank you for posting it! Wow, you’ve done it again! I just made your brownies last week, and now just tried this cake recipe to have something for Halloween! I dyed it bright pumpkin orange and made a chestnut frosting for it, and it’s holding up perfectly! Just as a quick note, because I’m in Japan where the cake flour just isn’t quite up to baking anything sturdy, I mixed half and half – cake flour with strong bread flour. I did notice that it came out a tiny bit grainy, so I might try using 75% cake flour next time and see if I don’t push my luck. 🙂 Either way, it’s still solid, didn’t sink in anywhere, rich and BUTTERY! I didn’t get that eggy smell I smell with almost all other yellow cakes, and it’s amazing! Thank you for making my Halloween so much sweeter (and lighter and fluffier….and me a little heavier, probably… ;D )! I’ll be trying more of your recipes and commenting when I do! Yes, you can use cake flour. It will change the texture a little (it should be lighter, and a little more crumbly). You can halve the recipe as well, but that would be enough for 1 cake pan. I hope that helps! Hi! I just baked this cake. I used apple cider vinegar with the milk and now my cake tastes like apple cider vinegar! I made sure to use exactly the amount called for… why is this happening? The cakes are perfect, except for that part. I’m hoping the icing will get rid of the flavour but I don’t have time to remake the cakes. Anyway, I encourage others to make this recipe, but don’t use apple cider vinegar! I’m glad that the cakes turned out perfectly for you. I’ve made this cake with apple cider vinegar before, and 2 tsp of it usually isn’t enough to make the entire cake taste like apple cider, so I’m surprised to hear that happened to you. But I’ll make a note of it in the recipe as well. Thank you for letting me know! I made this cake today and I am extremely happy with the way it turned out ! I followed all the instructions and did not change a thing . The cake looked very nice and also tasted great . A very lovely moist and light cake that you can do a lot with 🙂 super grateful to Dini for sharing this wonderful recipe! I’m really glad you liked the recipe Lalita. 🙂 Thanks so much for letting me know! It indeed is best of all the vanilla cake recipes in the world… Super soft yet buttery texture, love it! Hello, I have just made the sponge for this cake and was going to start frosting it with your buttercream frosting recipe however the cake is for tomorrow and I don’t have room in my fridge to store it overnight. Is it better to frost tomorrow or can I leave it at room temperature frosted overnight? You can frost the cake today, but if it’s possible, keep it in a cool area, under a cake carrier/cake dome so that the frosting won’t dry out. If the whole cake will be covered by frosting, then the frosting will protect the cake from drying out too. Hey i wanted to ask if i could use this recipe as the cake base for my fondant cake?? 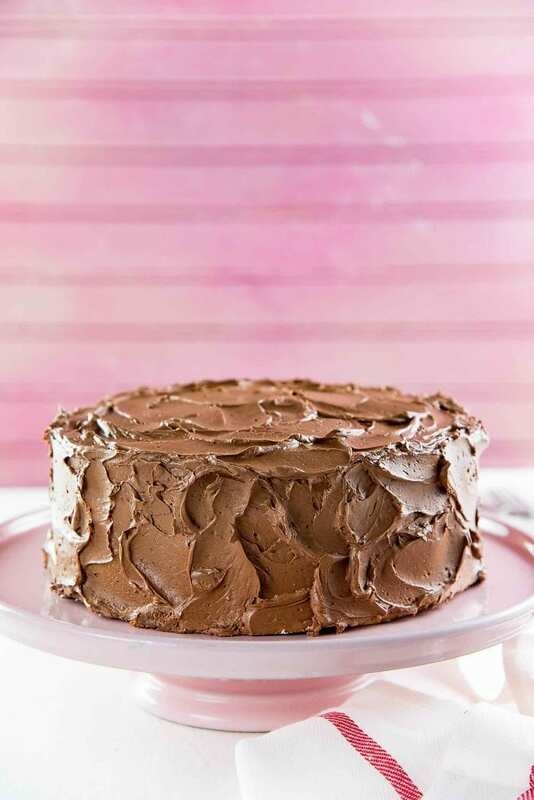 This cake is a soft, but if it’s just a one tiered fondant cake, with ganache coating, or a good sturdy buttercream frosting, it should hold up well with fondant. I haven’t personally used this cake to cover with fondant, but I have used this for wedding cakes with 3 tiers of cake. I hope that helps! Hi! I have baked your recipe a few times now, and it always comes out perfectly! I was hoping you could help me, a friend has asked for an egg free vanilla cake, do you think I could use an egg substitute in this recipe? Thank you in advance. I haven’t personally tried to make this recipe with an egg substitute, so I can’t be sure how the cake would turn out. I have used apple sauce as egg replacements for pancakes, and it’s worked perfect for them, but I cannot be sure it would work in this recipe. The rule of thumb for me is to usually substitute each egg with 1/4 cup of apple sauce. I would definitely recommend trying a recipe that is specifically tested to be egg less so you know you will get perfect results! I hope that helps! I love visiting your website just because I always find something and interest here. Baking a variety of cakes is my passion and profession as well. Keep posting such interesting recipes and ideas. Thanks a lot. evenly and rise evenly but I don’t know if u would recommend this. I find that I don’t need to use a heating core for 8 inch cakes and even 9 inch cakes. But I do use them for 10 inch cakes and higher. However, you can use a flower nail as a heating core if you like. If you are looking to make the cake in an 8 inch pan, and would like to have a nice flat surface, I would also recommend using baking strips (bake even strips)! That’s what I use regularly to get even flat surfaces for my 8 and 9 inch cakes. If you do use a flower nail as a heating core, remember to spray it with non stick spray (or butter and flour them), so that they don’t stick to the cake. Thanks so much! I just baked the cake and it turned out amazing! Thank you for letting me know Laila! Cake flour tends to make a cake a lot lighter as it has less gluten. This can make the cake seem more crumbly than a cake made with all purpose flour. I hope that helps! Thank you for your quick response, I made your vanilla butter cream frosting. It was very good. can you help me with mocha butter cream frosting? how much chocolate and coffee do i have to put in based on your receipts ? 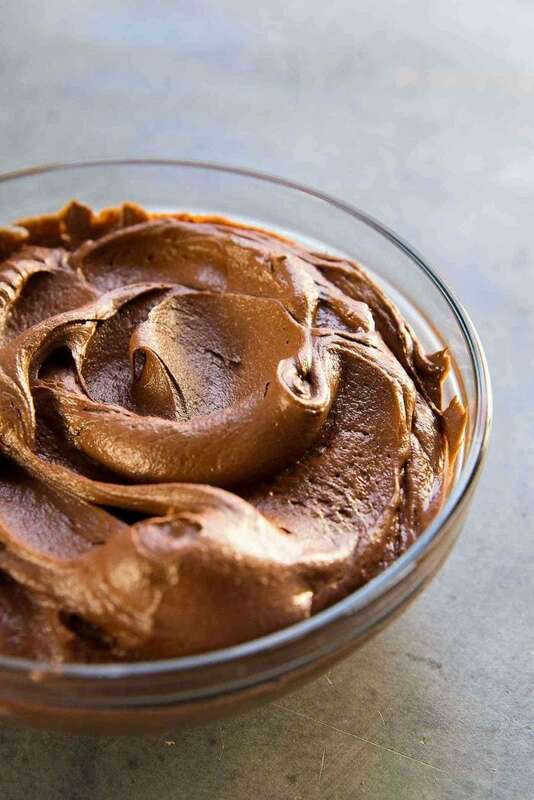 For Mocha buttercream, I use my chocolate butter cream as the base and add dissolved instant coffee into the frosting. 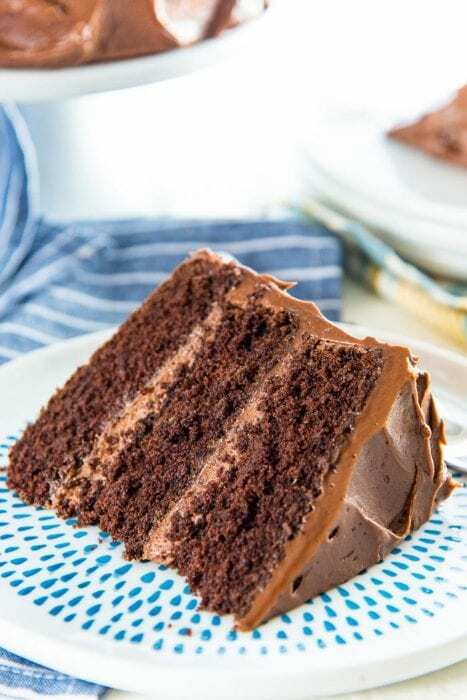 The recipe is here – https://www.theflavorbender.com/easy-creamy-chocolate-buttercream-frosting/ and I dissolve about 1 tsp of instant coffee in 1 tbsp warm cream and add it to the frosting. I hope that helps! 4 oz of butter is usually 1 stick of butter (8 tablespoons), so it would be 1/2 cup. I hope that helps! Can I bake this in one 10″ springform pan? Unfortunately, I haven’t baked this recipe in a 10 inch pan, so it’s difficult for me to predict how long it would take for it to bake properly and evenly, and how high the sides should be for a 10 inch cake pan. I just made this cake and tested it with a toothpick and took it out as soon as it was done. I mixed in the flour on the very lowest speed of the mixer and turned it off as soon as the flour was incorporated. However it did not rise well and sunk just a little in the middle. And I’m wondering if it did that because I moved the pan around to turn it halfway during baking as you suggested. I thought possibly it could be my baking powder, but I have cupcakes in the oven now at 350, not 325, and they rose well. I am worried that it will be dense and heavy and this is for my grandson’s birthday party. I’m having the same problem. Not springing back up in the center. I think the temp is too low or maybe I should have split to 3 pans. I’m also at a reasonably high altitude. The reason why the cake isn’t springing back up while baking is because it wasn’t baking properly in the middle. If you’re baking at high altitudes, then the oven temperature needs to be increased by 25-50°F, so that the cake will bake faster. This is because of the lower pressure at higher altitudes, which requires the cake to rise quickly and form a stable structure so that the cake can bake through. I hope that helps. Hi, thanks for the detailed instructions! I’ve just made it two days in advance for my son’s second birthday. How should I store it – room temperature or in the fridge? Thanks! The cake is best frosted the day before. However, if you have already frosted it (since it’s two days before), you can keep it in the fridge to allow the buttercream frosting to harden, and then wrap it lightly with plastic wrap and store it until the day you will be serving the cake. Just make sure to take it out a few hours before you serve it to allow the cake to return to room temperature 🙂 I hope that helps! It looked great coming out of the oven but as it cooled it shrunk, not sure what I did wrong? How much did the cake shrink? Did the sides shrink away from the pan? Usually if the sides shrink too much, this could be a sign of the cake being over-baked, or over-mixed. I would recommend mixing the cake batter as little as possible when adding the flour (using a spatula to mix in the flour is a good way to avoid over-mixing) and testing the cake earlier while it’s baking, and removing the cake from the oven as soon as a toothpick or cake tester comes out clean, OR as soon as you feel a very light spring on the cake surface when you touch the surface. When it can out of the oven it was level with the top of the cake pan and now it is about 1/2 inch lower all over, still nice and flat but I’m afraid it will be dense and not fluffy. I haven’t tried it yet looks good other then shrinking! Thank you for getting back to me. There is usually just a little bit of deflating from the top of the cake when it comes out of the oven. The hot air inside the cake cools down and makes the cake deflate a little. The fact that the cake top is nice and flat is a good sign! If the middle of the cake was sunken, that would be a worry. Unfortunately, it would be hard to determine if the cake deflated too much, until the cake is cut into. Like you mentioned, if the cake is too dense, then it could be that the raising agents (like the baking powder) might not have been fresh, or there was some over-beating when or after the flour was added. Could you let me know if the cake texture was good or too dense when you do get to try it? Thank you for the recipe, the cake was truly delicious! Hi, I have a question; one of the ingredients calls for white wine vinegar/ apple vinegar cider. Is that combined with the oil+sugar+butter+ eggs+ milk and vanilla? Yes, the vinegar is mixed with the milk, and then added to the cake batter along with the rest of the ingredients. Best vanilla cake! My husband felt it was too eggy. However, this cake had the best texture for a baked from scratch cake. I will bake it again. You are so right, everyone should know how to make a classic vanilla cake. I love how easy you’ve made it with all your tips. Thank you so much for being so detailed with this recipe. I just made a sheet cake to enjoy this weekend and it came out perfectly, so buttery! I’m also team add one egg at a time! Love this mouthwatering cake recipe like woah!!! So good!